In Dan Jones’ exuberant and playful painting, Brick Lane is a stage upon which an epic political drama is enacted. From this vantage point at the corner of the Truman Brewery, we see an Anti-Racist demonstration advancing up Brick Lane, while a bunch of skinheads stand at the junction with Hanbury St outside the fortuitously named “Skin Corner.” Meanwhile, a policeman stops a black boy on the opposite corner in front of a partially visible sign reading as “Sus,” in reference to the “Sus” law that permitted police to stop and search anyone on suspicion, a law repealed in 1981. And in the foreground of all this action, life goes on – two senior Bengali men embrace, as Dan and his family arrive to join the march, while bystanders of different creeds and colours chat together. 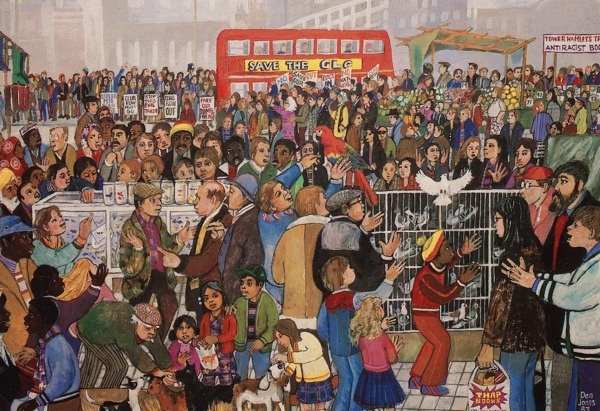 More than thirty years since Dan painted this scene, many of the premises on Brick Lane have changed hands, but the recent attempted march by the English Defence League brings the central drama of this picture back into the present tense. Dan Jones’ mother was the artist Pearl Binder, who came to live in Whitechapel in the nineteen twenties, and since 1967, Dan has lived down in Cable St where he brought up his family in an old terraced house next to the Crown & Dolphin. 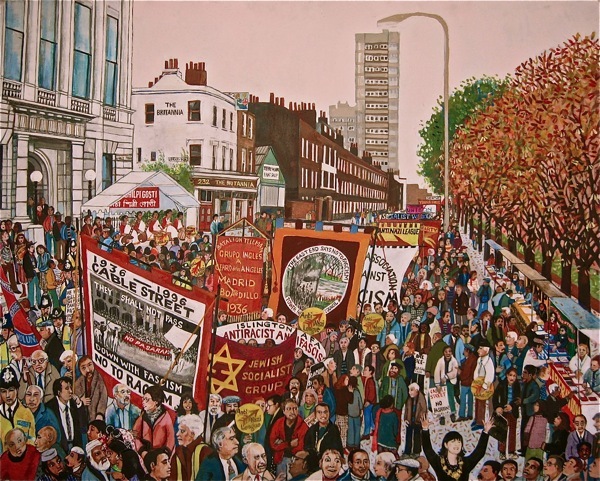 A prolific painter, Dan has creating many panoramic works – often of political scenes, such as you see here, as well as smaller pictures produced to illustrate two books of Nursery Rhymes, “Inky, Pinky, Ponky” and “Mother Goose comes to Cable St,” both published in the eighties. In recent years, he has undertaken a series of large playground murals portraying school children and the infinite variety of their games and rhymes. 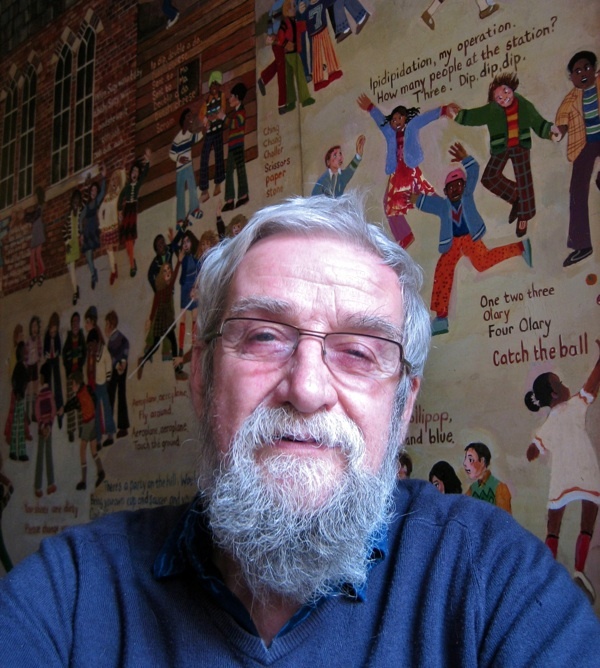 Employed at first in youth work in the Cable St area, and subsequently involved in social work with immigrant families, Dan has been a popular figure in the East End for many years, and his canvases are crammed with affectionate portraits of hundreds of the people that he has come to know through his work and political campaigning. Today Dan works for Amnesty International, and continues to paint and to pursue his lifelong passion for collecting rhymes. 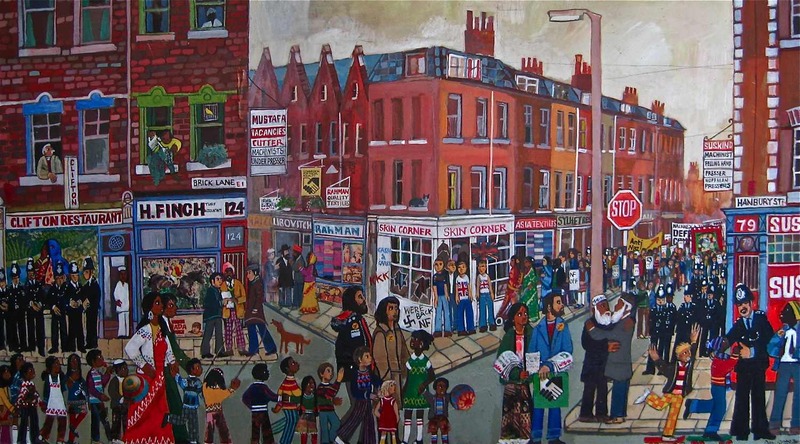 There is a highly personal vision of the East End manifest in Dan Jones’ paintings, which captivate me with the quality of their intricate detail and tender observation. When Dan showed me his work, he pointed out the names of all the people portrayed and told me the story behind every picture. 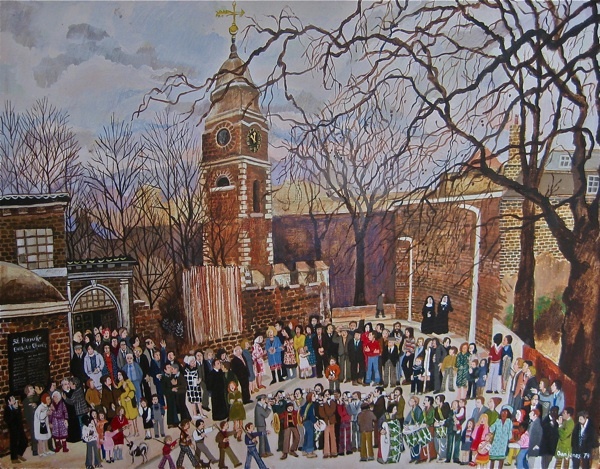 Like the Pipe & Drum Band in Wapping painted by Dan in 1974 – to give but one example – which had been going since the eighteen eighties using the same sheet music, their performances were a living fossil of the music of those days until a row closed them down in 1980. “They were good – good flute players and renowned as boxers,” Dan informed me respectfully. The End of Club Row, 1983. The animal market held in Sclater St and Club Row was closed after protests by Animal Rights’ Campaigners. Last Supper at St Botolph’s, Aldgate. 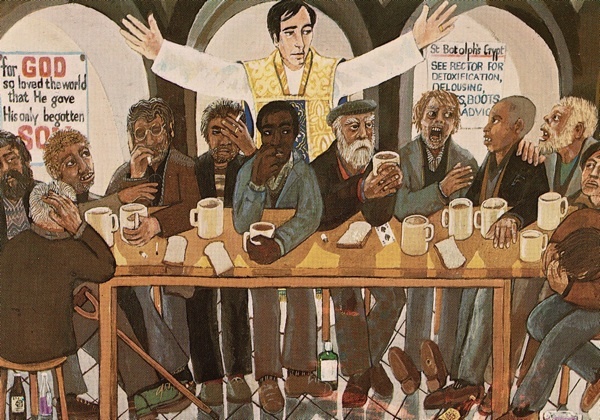 Reverend Malcolm Johnston preaches to the homeless at Easter 1982. Pipe and Drum Band in Tent St, Wapping, 1974. 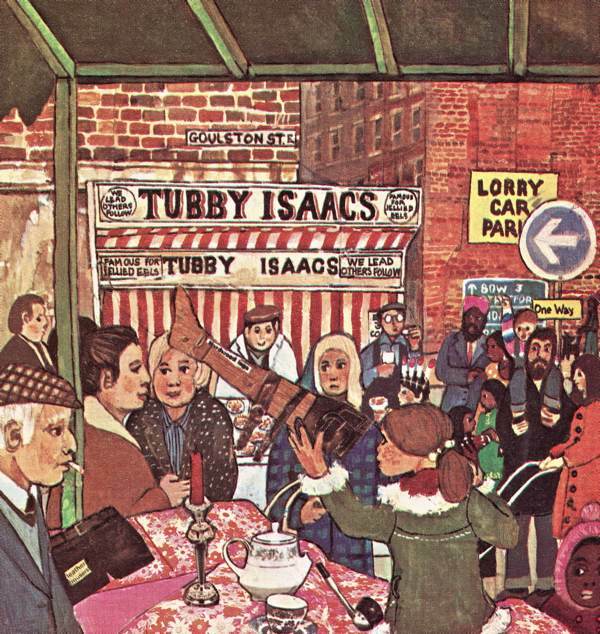 Live poultry sold in Hessel St.
Tubby Isaacs in Goulston St, Petticoat Lane. 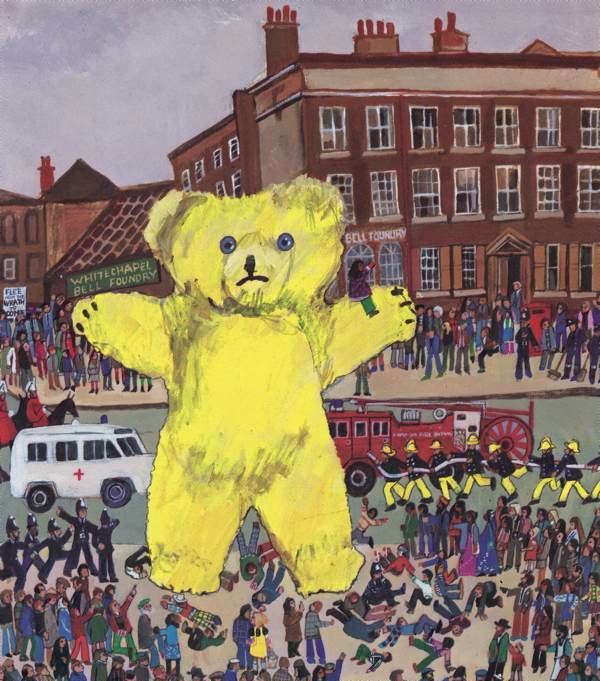 A Teddy Bear rampages outside the Whitechapel Bell Foundry. Funeral of a pig in Cable St, Dan Jones and his family come out of their house to watch. Look at Dan’s interactive playground painting by clicking here. These bring back memories. Particularly of processions in Wapping. And hot sarsaparilla on sale. For reasons I cannot fathom one of my earliest memories is of cheese being sliced with a wire at the Coop in Watney Market. And most particularly, recollections of Malcolm Johnson who I met once, and who was funny and charming, and who it would be nice to see a Gentle Author profile of. I used to have a stock of postcards of Dan’s St Botolph’s painting, I’ve kept the last one for myself! Impossible for me to look at any depiction of Club Row market and not peer to see if there is any one who looks like my grandad but he sold small caged birds rather than pigeons. Poor creatures, I can still hear them all in their cages in his flat. Wonderful! I share with all three of my children, now in their twenties and thirties, happy memories of poring over Dan Jones’ illustrations in ‘Inky Pinky Ponky’ and ‘Mother Goose comes to Cable Street’ while reciting the rhymes with great gusto. He evokes city life with such affection and enthusiasm, and though not from London, much less Spitalfields, we enjoyed hunting for familiar references. Now these books are becoming a part of my grandchildren’s childhoods too. a visual treat! interesting life. Wonderful! Would love to own some prints. My nan and grandad were from Shadwell and Wapping respectively and were at the Battle of Cable Street. Some Dan prints are still in stock at the Brick Lane Bookshop (http://bricklanebookshop.com) and you can see a really big playground painting hanging over a staircase at the Bethnal Green Museum. 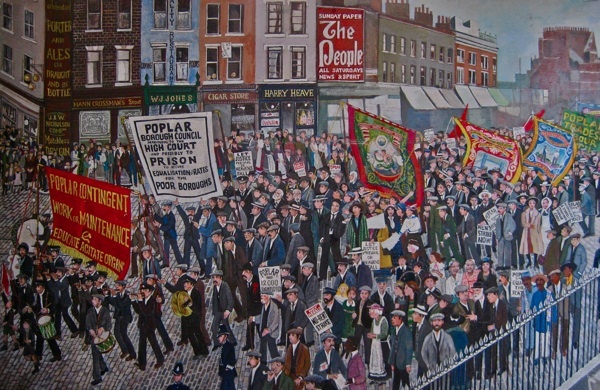 Dan’s postcard of a ‘Pageant of Working Class History in Clerkenwell’ showing Karl Marx can still be purchased from the Marx Memorial Library in Clerkenwell. These are wonderful paintings. I can still visualise their remote origins in Townson, ca. 1954. I have always found Dan’s pictures such a joy : evocative, affecting, humorous and compelling. This collection is superb and for me a vibrant reminder of my time in the area from 1960. I also have the great privilege to have a painting by Dan . It for ever celebrates the many actors, directors, designers, administrators, young people and Board members who were the creative people who took the Half Moon Young People’s Theatre to such heights from their then base in Stepney. 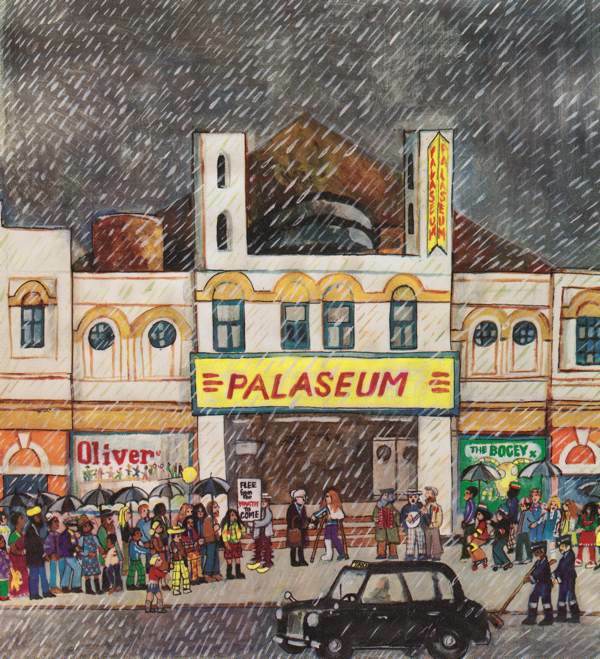 The period covered in the painting is 1985 to 1990 and as well as showing so many people , there are images of some of the productions that were taken into Bethnal Green schools during that time. Dan himself appears, cycling along the Whitechapel Road, long scarf billowing out behind him as he passes the former THAP bookshop, of very fond memory. A deeply valued and very personal mememto for me and also a lovely example of Dan’s stunning gifts as an artist. Hi Dan my name is Steve and I remember your work as a little boy because still to this day I have the hardback book of mother goose comes to cable street I used to love this book because I lived on St. George’s east in one of the block of flats “stockholme house” I also used to go to St. Paul’s primary school briefly and I remember the area well as a little boy, had my 1st wimpy in watney market and pie and mash just nr shadwell tube station also in them days at watney market they was two white tall block of flats which I am sure years later they knocked down because of asbostos I left with my dad in the early 80s to move to Folkestone Kent which I have been ever since but I do have a lot of great memory’s of the east end and finding your pics here I can relate to most as you can guess, thank you so much what you done in the past because when I left I still used to look at my book at times to remember the area . Really interesting to read about Dan Jones. I have had a copy/print (not sure) of a picture by Dan Jones depicting the Grunwick Film Processing Strike that took place in the 1970s. I am delighted to see this series of life affirming images . I had the pleasure of interviewing Pearl Binder about her memories of the AIA (Artists’ International Asociation), and she was keen to mention the work that Dan was doing at that time, particulerly in connection with the Blair Peach outrage. The Wikipedia entry for Pearl Binder is rather odd at the moment, a scattering of random facts with notable omissions and little continuity — I hope Dan might be willing to correct this some time. These pictures bring a lot of memories back; of the artist’s work and the area. I went to school with Dan’s daughter Polly and for my birthday one year she gave me a copy of his nursery rhymes book. I loved it and wished I still had it. I knew Dan Jones when he was ayouth owrke rin Calbel Street E.! 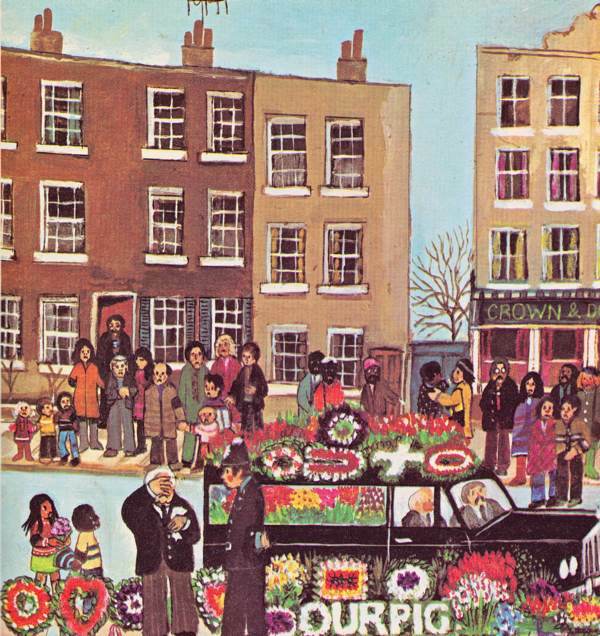 my brother and sister along with myself attended on a regular basis when we lived in nShadwell Gardens on Cable Street. 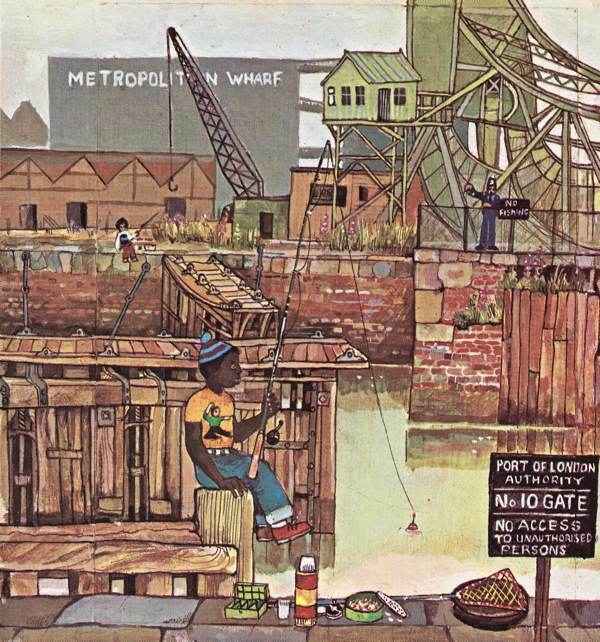 I now live in Melbourne Australia though remember the painitngs by Dan I recall most ofthem as a youth and still note that they really capture the feel ofthe East End it was aplacew that cultivated communities. I now work with the Aboriginal community in Melbourne and witenss strong similarities to the Eaast End in reference to community. Thanks for the paintings they are apart of history. Hi i was delighted to come across this article of Dan Jones . what a great man , as a young man of jamacian origin and living in a tough area . i remember hanging out with my mates coco harry and micky curran dan was always there to talk to and give advice .my football career came to an end through injury and i moved to clochester in 1975 andlost all contact it would be great to he from Dan or anyone that knew me . Fantastic, vibrant and with a real feel for the colourful East End and it’s people. I have many fond memories of Dan and the East End…. My husband and I have loved looking at these illustrations, are they available to buy on print or canvas? My husband grew up on Cable Street and our parents lived on Brick Lane in the late 70s. These illustrations are so affectionate, humorous, political, historical and are full of humanity. I now have a lot more appreciation for my parents’ experience. I feel so proud to be from the East End, thank you. You probably won’t remember me or my sister (Sarah), but we lived about 10 doors down from you. I’m sure you’ll remember my dad who was Indian and my mum who is white. 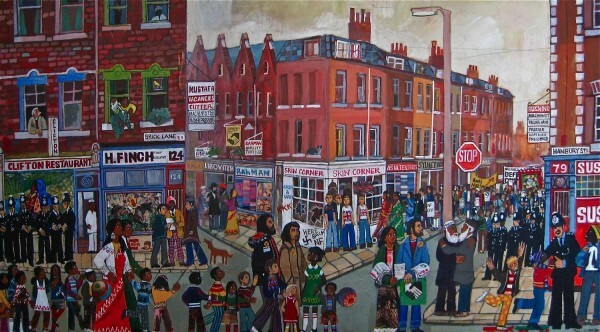 They moved to cable street in 1980 when I was born and being that they were in a mixed ethnic relationship they experinced first hand what some of your paintings depict. Your paintings also have brought me great joy as having looked at most of your work available online, it fills me with nostalgic memories of places that may have been lost. The works you have created are all well known places to me and also to my wife ( Sahima) who is of Bangladeshi origin. 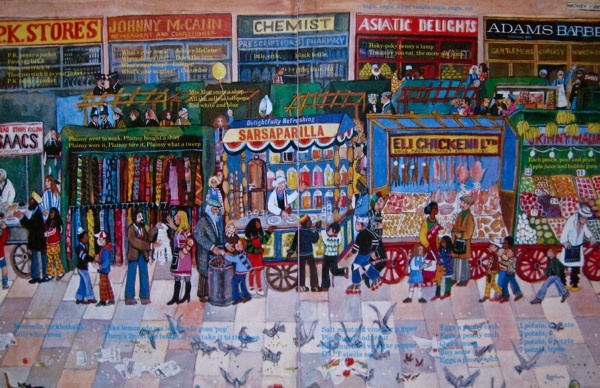 Sahima’s parents lived in the Brick Lane area and Whitechapel area through the late 70′s and now in Brady street so she has also taken a great liking to your work. I think its great how you’ve captured the true essence of Tower Hamlets and how it was. I could go on for ages but instead I will just continue to enjoy your works and hopefully my children will too. 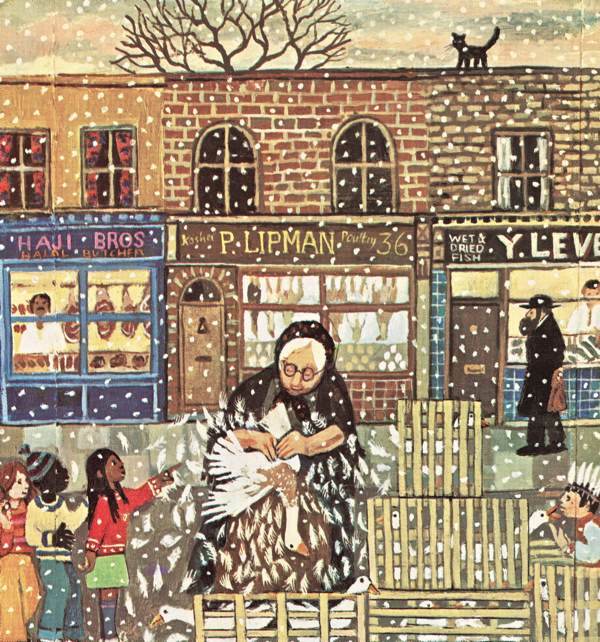 I forgot to mention that my husband Andrew(who knew Dan and his daughter) recently bought a copy of Mother Goose Comes to Cable Street, which we have been reading with great enjoyment. Dan Jones has so much understanding of local Eastenders, much more so than the younger artists of today who are using the area as a stop gap while they are “slumming it”. Dan is an Eastender through and through. I had both inky pinky ponky and mother goose comes to cable st as a child. I literally loved them to pieces I read and re – read them. I am also very lucky to know Dan and his family as I went to school with his daughter Polly. They are a wonderfully kind family. And Dan is a true artist. I wouldn’t mind buying a painting? Where can I do that? I can only thank you for your skill at evoking history past and present in such wonderful paintings. I have had three of your pictures on my walls for decades, but unfortunately they have inevitably faded. I managed to get a couple of them from the run at the exhibition you had in a library building last year, but I could not get my favorite which is the ‘E1 Festival, Shadwell Basin of 1977. Perhaps I like it because you captured Dennis the Dragon amidst the crowds. If you can advise me how to obtain a new bright copy, please let me know. Hope yu continue to paint these important scenes. Very best wishes to you and your good lady wife. Are you the Dan Jones I recall involved with the squatters in Stepney in 1969? 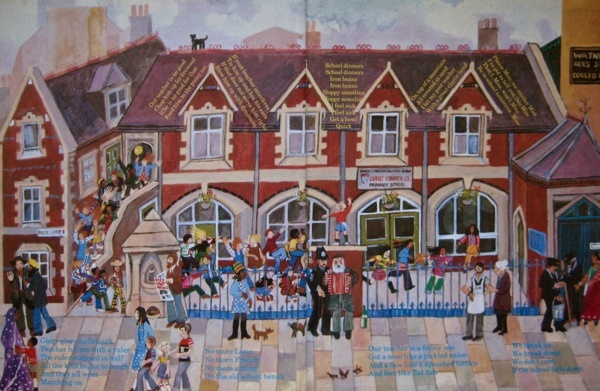 I was waiting to see the painting of Wellclose school and it turned out to be the one Dan was photographed in front of. 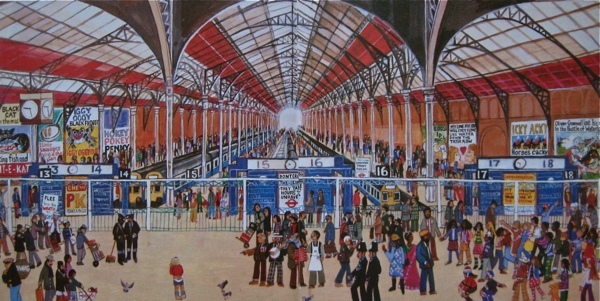 The print of this was bought for me by my friend many years ago as it was the school her nan attended. I absolutely love it. I have the immense pleasure of working with Dan at the moment to bring together his playground games collection and pictures for a website. Happy to keep people posted via this site on our progress.